Chances are that you haven’t considered Iran as a must see destination. Who would, right? With the usual negative rhetoric towards the country and its political representatives.. it makes one doubt the safety. 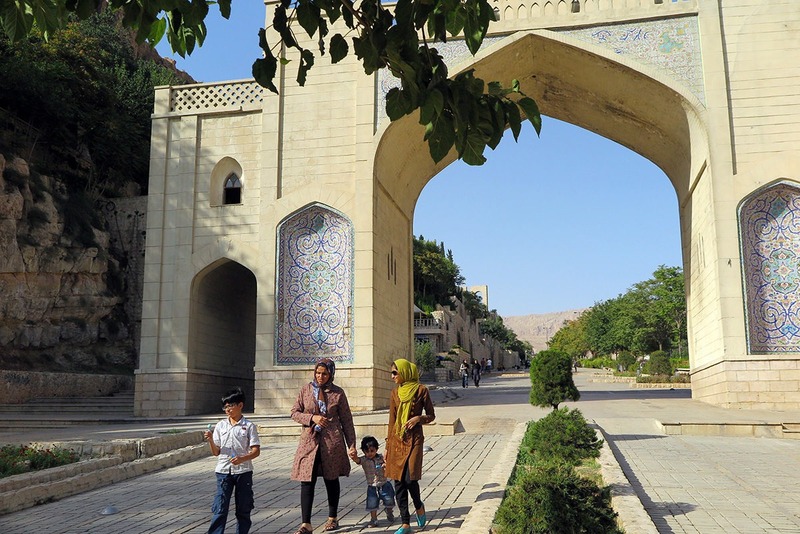 You can see it everywhere – from shy smiles, to curious questions about where you’re from, Iranians are welcoming to visitors and are generally happy to see travellers coming. In traditional hotels and houses, they’ll treat you like family and you might even be invited for a homemade meal, just from a person on the street! No wonder Couchsurfing is so popular there. I haven’t tried Couchsurfing in Iran myself, but have heard the only potential ‘threat’ is that a host might be too friendly and might want to accompany you everywhere. See also my fellow blogger’s take on Iranian hospitality. 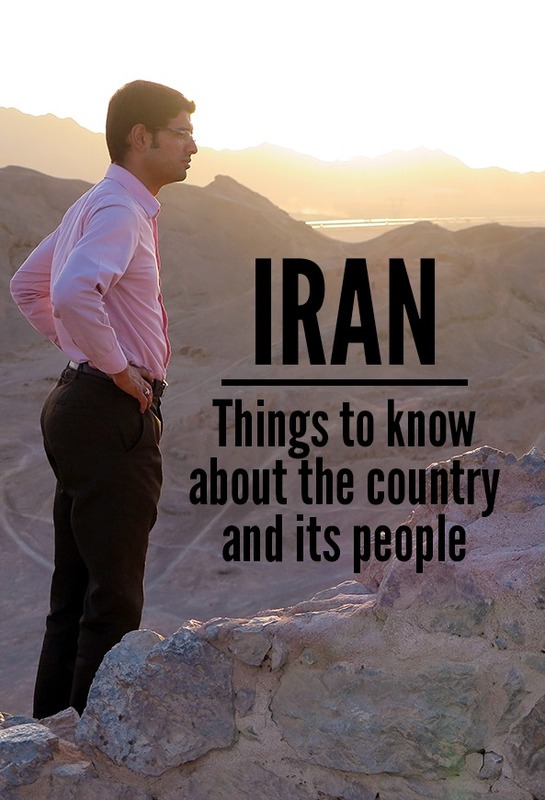 Check out also this comprehensive guide on traveling to Iran. Most Iranians I’ve met feel sad about the image of Iran abroad. Of course, the information they get is a bit biased, but they are always hopeful that you as a traveler to Iran will then tell everyone how great it’s been there! We were often asked about what we thought of Iran and we always honestly replied how amazed we were by the hospitality of people. Iran has the bad luck to lie in an unstable region, but it’s one of the safest countries in the area. 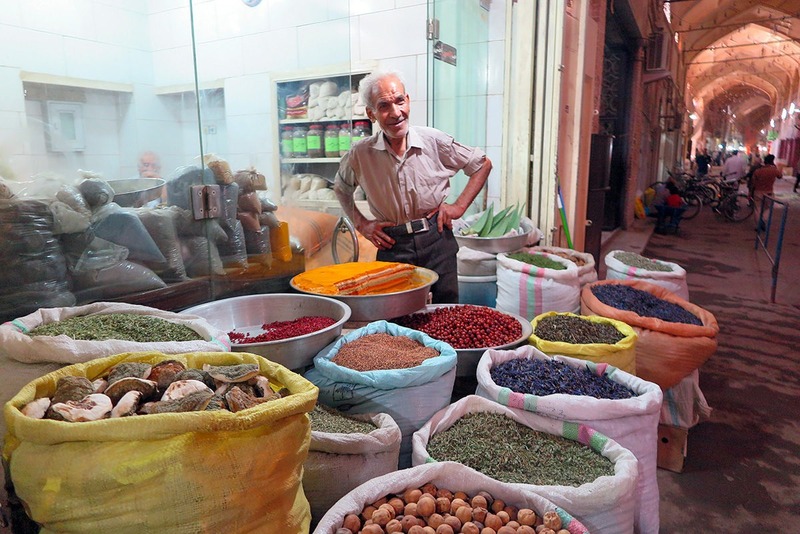 A friendly local in his spice shop.. in a bazaar! No matter what your nationality or religion, you’ll be perfectly fine. Don’t cause conflicts and follow the local rules and you have nothing to worry about. The troubled areas of Iran are along its borders with Iraq, Afghanistan and Pakistan. 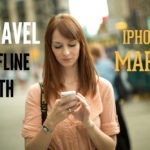 Many travellers are fine in those areas as well, but for the cautious traveler it’s a big no-no. When it comes to practicalities, visa is supposedly not issued to everybody. For me as a Czech citizen, there was no problem. I could even get an on-arrival visa. If you already have an Israeli stamp in your passport, get a second passport for your Iranian visa. If you’re American or British, you’ll need a local guide accompanying you everywhere. Even if you’re Harley Davidson riders, like the Brits we met in Yazd. Fortunately, the guides are often very easy going, so fear not that you would end up with a government official as if you were in North Korea or somewhere. Read more on Iran safety here. 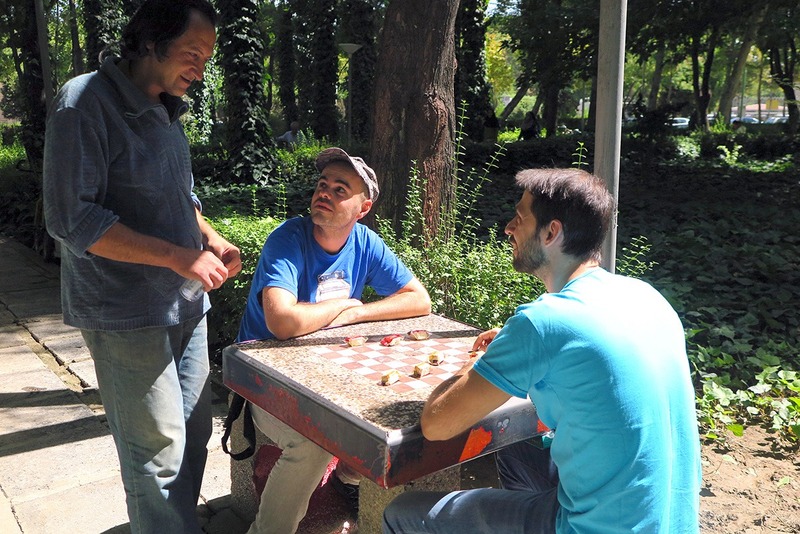 Friends playing chess with gaz (local sweets) in Esfahan.. the friendly Iranian who passed by had a sweet tooth and needed a candy! Iran is really cheap for us visitors from the Western world. Even with the high inflation and sometimes-outdated prices in guidebooks, prices are still relatively low. I’d say perhaps on the same level as in Thailand. I spent only about 500 EUR in 2 weeks – including accommodation, one local flight, food and souvenirs! 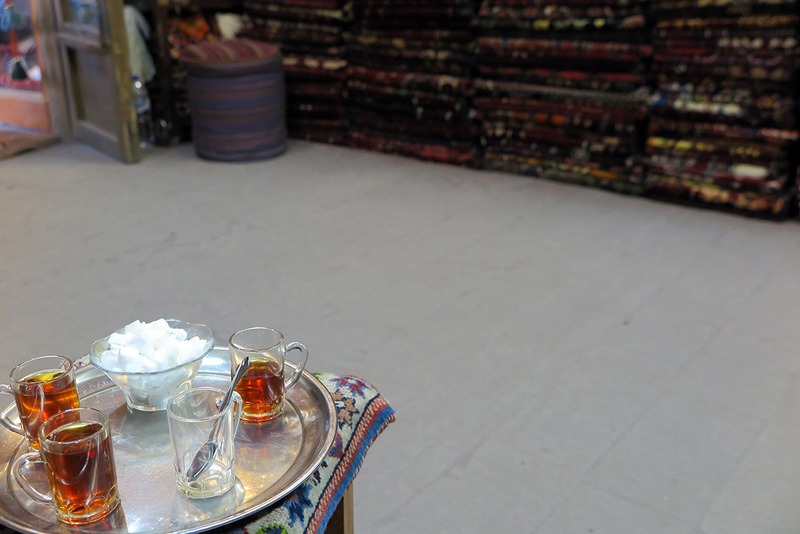 Having a tea at a carpet shop in Esfahan was quite fun and we had a good chat with the owner. Nobody of us bought anything. The infrastructure in Iran runs smoothly and people are well educated. Of course the people you’ll speak to will be mostly those with a good level of English, but that’s quite a big part of the young educated population. It’s a fact that it takes 10 years to gain a PhD in Iran! So those who study are very serious about it. 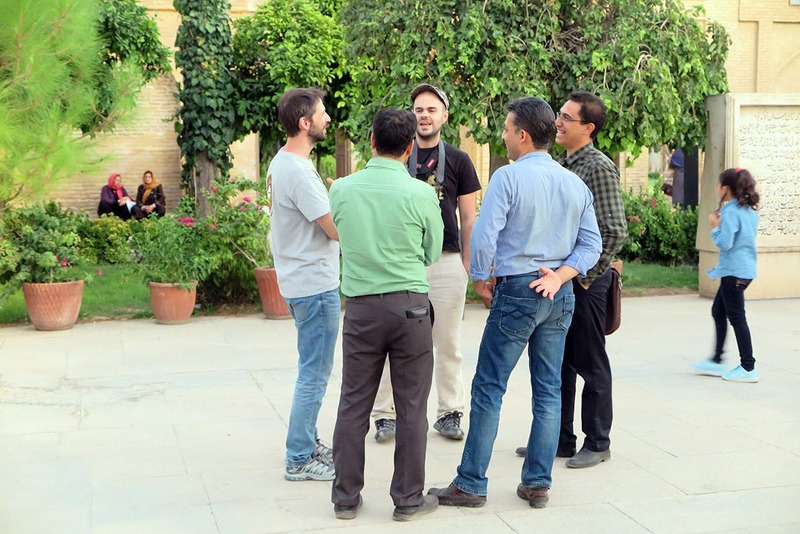 Smart PhD students often came for a chat – this scene is from poet Hafez’ mausoleum, Shiraz. Ok, 1300 years does sound like a long time. But the Persian culture shaped throughout the times of Persian Empire was not lost, rather absorbed into Iran’s Islam. 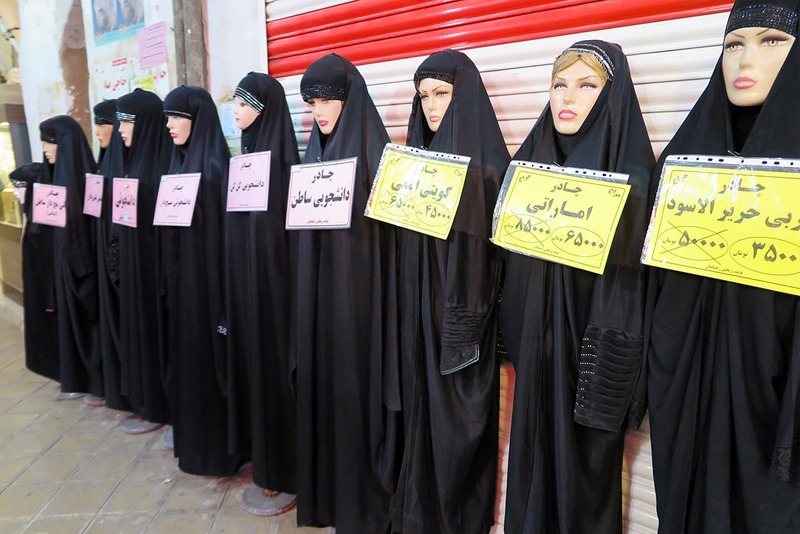 It is therefore a bit different to regimes in the neighboring countries, not only because Iran’s population is predominantly made of Shiite Muslims. Getting ready for an afternoon prayer.. first step is to roll out these big carpets. After you’ll speak with a few locals, you’ll notice how they naturally divide the past before and after the Revolution, when the spiritual leader Ayatollah Khomeini took over and Iran became more Islamic. Study Iran’s history, it’s incredibly interesting. I found Lonely Planet’s overview of Iran’s history very well described. Get a Lonely Planet guidebook now to do some reading before your trip. 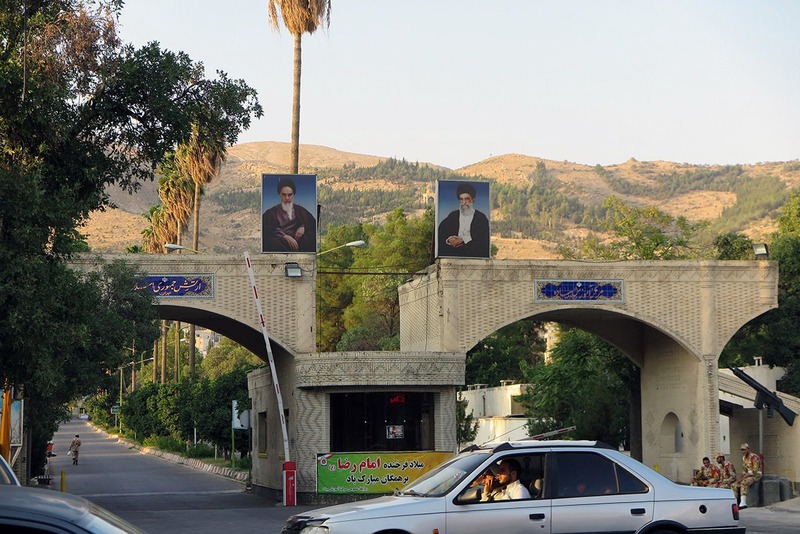 Portraits of Ayatollah Khomeini and the current Ayatollah Ali Khamenei are present everywhere you look. Iranians are so diverse – you can even meet green-eyed people! There are many ethnic groups living in Iran. You can see representatives of nomadic tribes and of the neighboring countries who have fully assimilated and become Iranians. You’ll be amazed by the big bright blue or green eyes of many! 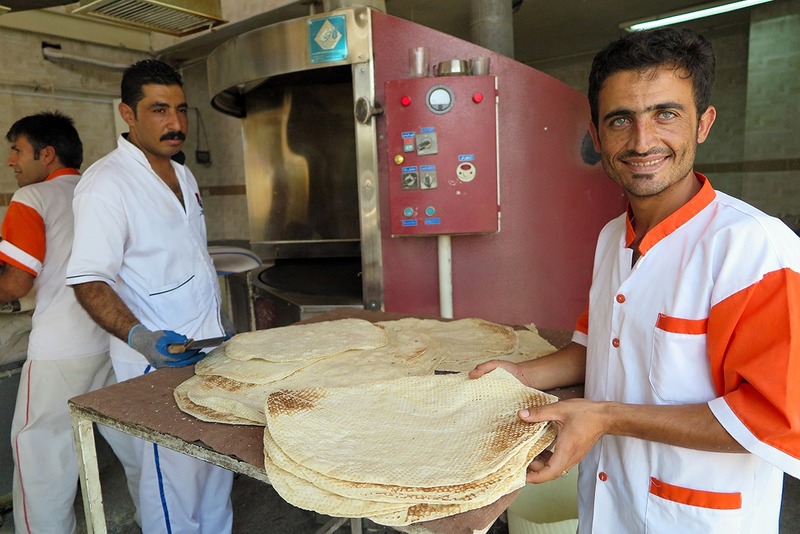 Green eyed baker in Shiraz, Iran. He can be either of an Afghan origin, or from a nomadic tribe. I’m not here to praise Iranian women’s freedom as it’s obviously far from what we’re used to in Europe, but compared to other countries in the region women have relatively more rights. Take the then 18 year old film director Samira Makhmalbaf who became world-famous by directing ‘The Apple’ in 1998. She’s a woman, and young! Also, as opposed to e.g. Saudi Arabia, women are allowed to drive. When it comes to women’s rights, Lonely Planet quite fittingly calls Iran the ‘Country of contrasts’. In fact, many households are ruled by women. Mothers have the upper hand at home while outside, it’s the men. This dynamic seems to work quite well for Iran. Persia has a long history and Iranians carry a lot of national pride in them. Some people you’ll meet might be critical to certain past or present representatives, but the overall feel you’ll get is that they are proud to be Iranian. 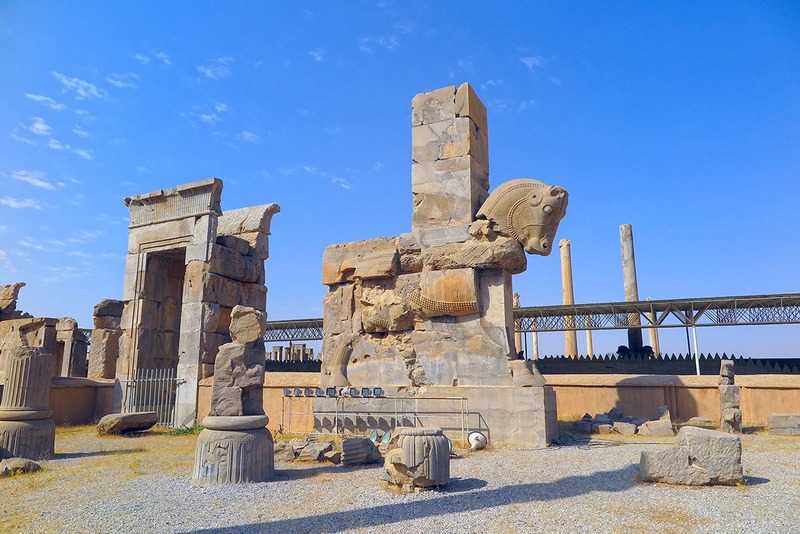 The incredible ancient city of Persepolis, just an hour away from Shiraz. I’ve never seen anything like it! Any patch of grass, or actually even a concrete sidewalk, is an ideal picnic spot! People roll out a Persian carpet, get out flasks with tea and some snacks and their favorite pastime is on! Some even bring gas stoves and actually cook their meals. If you’re in Esfahan, walk around the Imam Square in late afternoon, you’ll see many locals sitting down for a picnic with family or friends. If you’re lucky, you might even be invited to one. 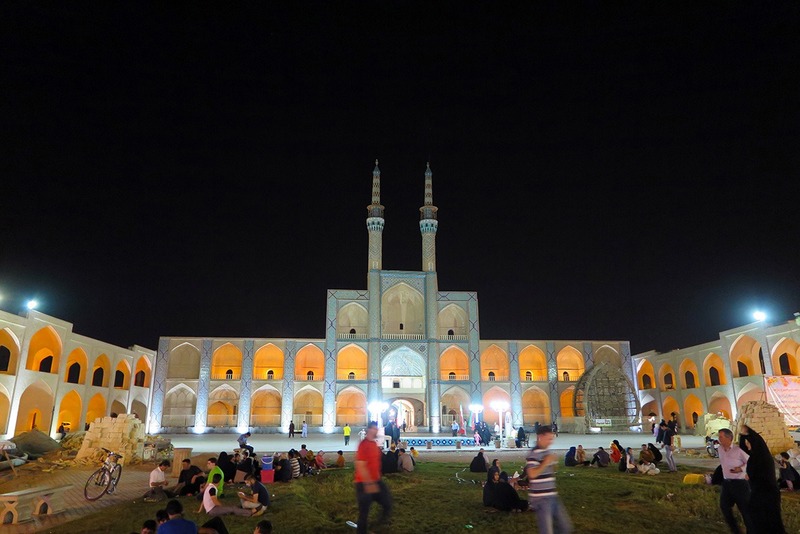 Iranians picnicking in front of Amir Chakhmaq Complex in Yazd, Iran. Love of family emanates from Iranians like from no other nation I’ve visited. Perhaps it’s also because they don’t use strollers much, so they carry their young ones in their arms. You can often encounter parents or grandparents cuddling their babies and it really seems like family is in the center of the universe for them. Women with kids in front of Quran Gate, Shiraz. You might find out there are not restaurants on every corner as you’re used to from your travels. 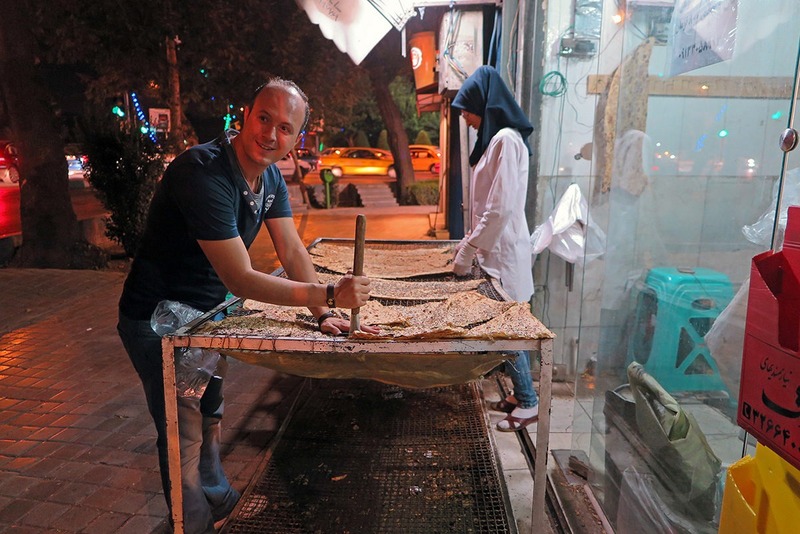 Iranians traditionally eat most of their meals at home (or on a picnic), with a work lunch occasionally taken at a street stand. It’s not that common to go eat out. Many of the restaurants you’ll encounter have been set up for tourists, and that’s not necessarily a bad thing. 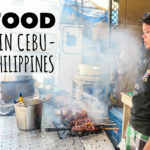 If you stay at a traditional house instead of a hotel, you can taste the real homemade cuisine that’s so sought after! 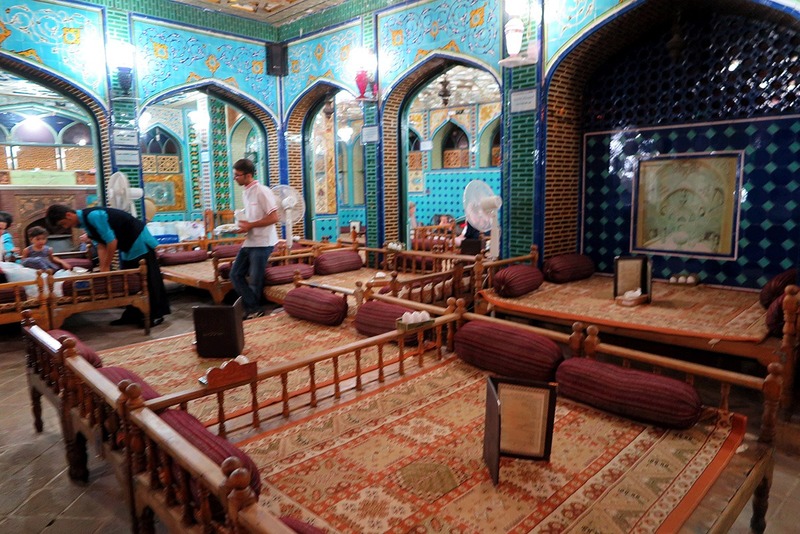 One of touristy, but good, restaurants: Traditional Banquet Hall in Esfahan. Generally speaking, the North including Tehran is much more liberal when it comes to views, opinions and even clothing. The further to the South you’ll go, the more long black chadors you’ll see and the more conservative and traditional people are. Just be aware of that if you travel down South. A wide selection of chadors in a bazaar of Yazd. Among the friendly people who’ll approach you, there might be an occasional vendor, but even if you’re taken into a carpet shop for a cup of tea, you’re in no way obliged to buy anything and you can easily get out of there. The lack of ‘pushiness’ from street vendors is refreshing! But it might not last forever. Iran is becoming increasingly more popular among travellers, so go visit while it’s still unspoiled by mass tourism! One resource that helped my tremendously to wrap my mind around the country’s history and better understand the people: Lonely Planet Guidebook. The one on Iran is a high quality one. Check it here. If you’re considering travelling to Iran, get inspired by my 2 week itinerary. And – I even have advice on what to wear (for both ladies and gents). For some further reading on the ethnicity of Iranians, the early history and cultural development, head to this Wikipedia article. What do you think? Would you travel to Iran? Have you been there already? Do you agree with my views? Enjoyed reading? Pin it for later! Thanks for that article, Iran is great, and we can learn so much from them. Even that is sometimes frustrating, these stupid laws, i was sorry for my friends, which i have made there. Best country!! i’m iranian and advice west word poeple to take a look at iran in social networks to see what really iran is. Beautiful comment, Julie, thank you. Nice article! 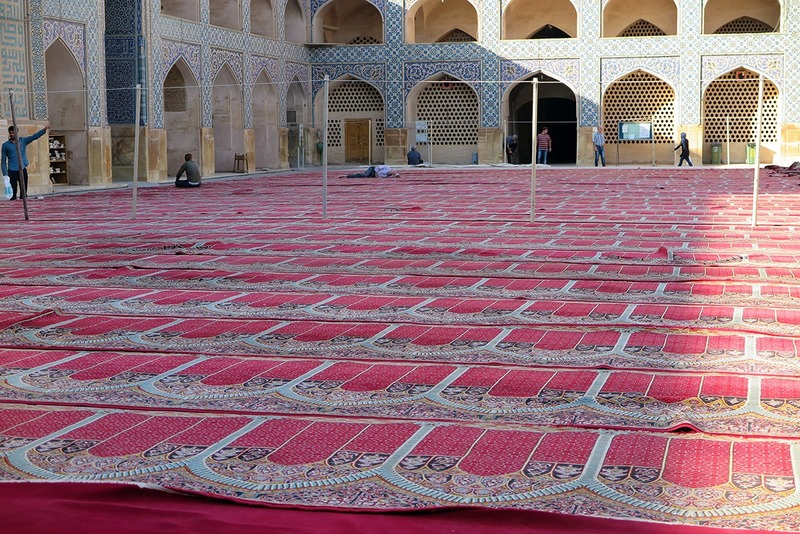 Almost everything I read about Iran is inaccurate – even from travel bloggers. But, this is a really fair and balanced list. This is a great read and now I want to go visit. Looks so eccentric and more than the media portrays. For me Iran is still like terra incognita, but hope to change it in nearest future. Indeed, the most decisive period of it’s history is connected with Islam. Zoroastrianism though can be considered as distinctive feature of ancient Iran. Naturally beautiful areas in Gilan and Mazandaran is very high. thank you very much for the great article about Iran ! I am from Iran and having read your article I can say you’re an amazing blogger and everything you said is true ! I was very eager to know how a tourist like you thinks about Iran ! It was really interesting ! I live in Iran , in Tehran ! It is truly an amazing country ! Thanks for stopping by Amir, and for leaving a nice comment! Many greetings to Tehran! as you said IRAN is a cheap destination to travel only 500$ for 2 weeks and stay in hotels and travel around. it is very reasonable, is not it? i would add lots of sunny days to benefits of Iran`s visit. DON`T forget to visit deserts and beaches of Iran. please don`t trust to anythings you hear every day in media. they work for politic and some are against friendly relationship between people around the world. but all of iranian respect to world peace. so come iran and enjoy. Thank you, Zahra. Travellers are now more and more exploring Iran and spreading the word about its beauty, friendliness of locals and the low cost of travel. Fortunately many people realize media is biased. I am living in Tehran, Iran. article Was very good and I enjoyed it. Thank you for the facts impartially spoke this country. Iran, a country with so much history and culture is thousands of years and I hope that day by day will be added to its tourists. Thank you, Mohammad. I think tourism is developing at a high speed at the moment, so you might soon be flooded with tourists from all over the world! I enjoyed my trip very much and have heard from many friends who loved it too. If you want my Advice , Don’t come here ALONE. what do u mean dear??!! I have visited Iran 6 times and it is a safe country, especially for women. It has many beautiful areas. The report is true. It is the most authentic report I read about Iran. If you do not try to shine at 12 in the night, you will be fine. But I can tell you every where you go before 9 pm will be OK for you. But just were complete normal dress like other girls in Iran and try (just try) to be around galls. I am 100 % sure, if any problem is going to happen for you, just shout, you will see how many people come to help! absolutely correct. without any exaggeration. 1) Although Iran is much safer than what majority of foreigners think, there are still dangerous times and places you should avoid or at least be accompanied by a MAN. It’s important that you understand i’m talking about a Man not a female friend. This tremendously reduces the risks of all types. BUT, in normal times of day and night in almost everywhere a tourist might like to visit, it’s completely safe even if u’re alone. After 10-11 pm it can be dangerous to go to not so crowded places. 2) Sometimes it becomes hard to find an Iranian who knows English really well. So I suggest you go there with at least one friend so you can enjoy your experience together, talk together, decide together, etc. You must get bored less frequently. The last thing: If in case u’re in trouble ask help. You will find Iranian people very helpful. do great and enjoy your trip. Hang in there, Lisa, the time will come! :) No need to thank me Sepid, your country is beautiful! I’m glad to see you had a good trip to Iran. I’m from Esfahan. And I’ll be waiting to show you the whole city when you come back. Thank you, Aghil :) Many greetings to Esfahan! Hello Mahshid. Thank you for your nice words and for the suggestion! I will make sure to visit more of the North next time :) Have a great day! North of Iran/there’s just jungles and Eurpean have lot’s of it !!!! Good to know, Saman, thank you! Thank you, Nadia :) Lovely to hear from you. 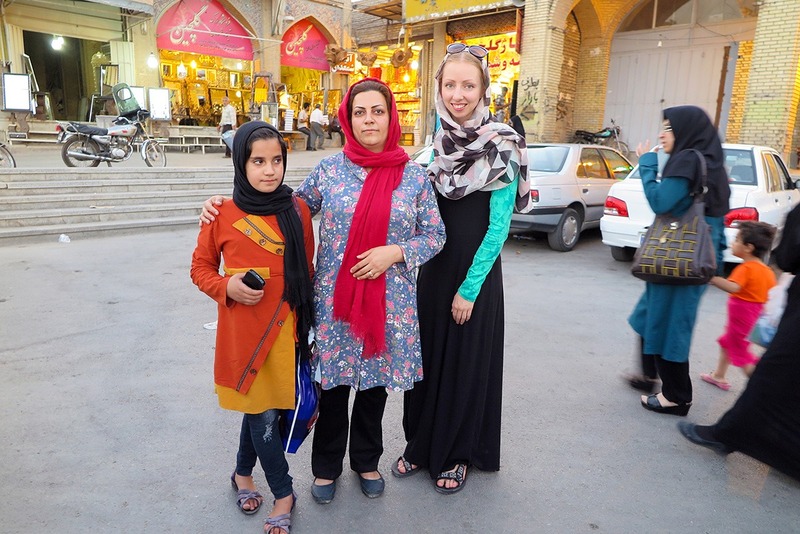 Now more and more travellers are exploring Iran and spreading the positive image about the country! Hi dear thank you for this beautiful article ,its very useful and more know about Iran people and culture.I am planning to travel Iran very soon ,inshallah after 2 or 3 week .I am vary happy to say that my girl friend she is there in Iran .I am really excited to see her and that beautiful lonely planet.Please pray and wishes. Hello Navaz, that’s great to hear! I’m sure it will all work out nicely and that you’ll enjoy the trip! I am Iranian,living in Tehran. hi everyone,i’m MUHAMAD ALI from Kashan, Iran;i’m 20 and studying electrical engineering at SHARIF university of technology;hopefully becoming a traveler in soon future. i’m ready to answer your questions about Iran; unbiased answers.fell free to ask your questions. Hi the very sweet Veronika, I’m truely happy that you enjoyed your trip to my homeland wishing it wasn’t your last. it makes me smile when I see nice, open hearted, open minded people like you make an effort to change the often negative public view toward a country not so reputed. Really appreciate your positive, kind feedback. Thank you Sahel :) Happy you enjoyed the article. Have a nice day! I am from yazd.Thanks a lot Veronika.people of the world should know more about Iran and they ought to change they views about Iran. Hi, interesting article and it certainly sounds like you enjoyed your time. I just want to point out though that women in all other parts of the region except Saudi Arabia are allowed to drive. Hello Emma, ok, thanks for pointing that out! That’s important! Hi, Happy to think like this about us, very interesting article. Foreigners think we are like Arabs or we are terrorists but it isn’t True. And I love my country by the way, Thank you for this nice article. Thanks Erfan :) Don’t worry, more and more people are travelling to Iran and discovering the country and the people. Dear Veronika , your article is awesome. I’m already happy to know people are coming to visit my beautiful country I’m a freelance tour guide and I enjoy answering your questions , and I work in a an office called Pintapin , we offer all the hotels and accomodation with a good discount rate and you can also use your credit cards to book, (visa and master) .I’d be glad to help u out. You should also visit shomal in the north. Its a beachy place. We happened to go in the winter and it was snowing when we got there. They had a ski lift to the top of the mountain and it went from humid cold beach to snow on the way up. Once we reached the top there was at least a foot of snow. So much fun! Also I ate at that same restaurant in Isfahan. I think we had ab ghoosht/dz. Thanks for this article I’m persian and really happy to read this !! It shows that ppl all around the world are knowing us by the facts which we have not by the rumours, instead of the limitations we have here you should consider the fact that we iranian welcome people from all around the world as much as you respect us and if you ever traveled here i just want you all to change the wrong aspect of iran by telling the true form of us to whoever you know ; it’s too sad to see foreign ppl believe the rumours and hate us . Hello Sanna, no worries, the word is already out there about the hospitality and friendliness of Iranian people :) There’s no real hatred, just ignorance, but things are slowly changing.. I think. Veronica thank you very much. I hope that in the future all people to know the truth about Iran. Thanks for stopping by, Mohamad :) Many greetings to Iran! The date of revolution was actually 1979 not 1978. Hello Hooman, I found it was usually stated as 1978-1979. Do you take just the final date? Hi … I ‘m really happy you enjoyed of traveling to Iran. I love this article so that all of this are true about Iran. I live in Shiraz , Iran . Did you visit my city? Hello Hadis, yes I visited Shiraz :) What a beautiful city! Have you ever been to karaj?? Thanks for your nice words! Many greetings to Iran! Hello Negar, thank you and don’t worry, people are seeing this, for now at least travellers do! and i was likee whaaaaaaaaaaaa……….????????? :) Yes, people’s misconceptions are often really wild. I know that feeling, Arash! I heard somebody being really surprised to learn we have TVs in the Czech Republic! :D So don’t worry at all about it :) Your countrymen are awesome people and travellers are already spreading the positive image. Thanks my friend for your article. No need to thank :) Many greetings from Prague! hiiiiiiii… i am a iranian boy and read your big text about iranian …………someting that you weite it…was so funny likely to libiral north and south…..
your website or yourself have not instagram accante?? I die to see someone saying the facts about Iran these days,you know. Thank you, Narges! You’re right, I didn’t criticize the religion :) I respect each country’s culture and religion. Northwest of Iran. Enjoy your stay in Iran. good article but maybe you write some bad things too. Hello Hamid, what do you mean? Thanks for your nice article and thanks for your visiting. You introduced my country very well.That was interesting. , New York , Paris , London , Tokyo etc their people are so kind. WE ..*ARE NOT*.. ٰTERRORISTS.I can not believe that a moment. perfect history,varied weather and hospitality. So the media is not everything. Thanks Veronika another time and thanks for reading my reply. Thank you, Mohammad. 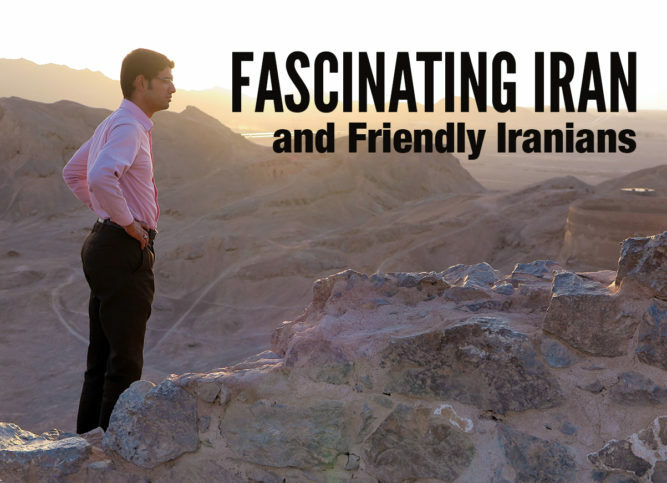 I encourage all travellers to go see Iran – the beauty of the country and the friendly people. It’s not common to find such friendly and hospitable people in the world, so Iran is very unique in that. The main challenge is to stay like that even when more and more tourists come! I hope Iran will not become as touristy as e.g. Paris. thank you for your good points about iran. every person has traveled to iran didnt penitent. Thank you, Farhad :) It’s so nice to see how you all care for your country’s image abroad. Thank you, Siavash, very nice of you :) Greetings from Prague! thanks for this beautiful article and your thinking about Iran wish you the best. Thanks a lot, Shahab, wish you the best too! Thank you Veronika for your great explanation . it’s our pleasure that you loved our country. Thank you, Mahtab! Yes, I really enjoyed my trip to Iran. Wow, that’s a great tip, thank you Ult! it really made me happy to read your article and to know your idea about my country. I just wanted to say that don’t listen to what media says and problems are between governments not people. Hello Pourya, thank you for stopping by! I’m glad you like the article. You’re so right, people to people should just be friendly no matter the politics. And that’s how I felt in Iran.. I am Iranian and I could say 99 per cent of what you said about Iran were myth that you brought from nowhere. Hi Sara, how interesting! If you care to elaborate, I’d love to hear the details. Hi lovely veronika! Im from IRAN … we are really kind and we love to see you very much! some peaples who didnt came here think iran is very bad but Im not agree with them! technology is very good in IRAN for example we are the first country in asia to use smartphones !!! all of peaples who live in tehran havereally expensive mobiles! our worst mobile is Iphone 6s ! believe me ! there are many celebritys in IRAN for example Shahab hosseini is winner of the oscar 2017 and can 2016 / ore mohammadreza golzar is very very very handsome ! and there are very laxury hotels in kish too! see you son in IRAN ! lovely girl!!!! I’ve recently watched the movie Salesman by Asghar Farhadi. Have you seen it? It’s a very good one. I’m a 15 years old Iranian girl. I want to say thank u for the nice article about my country that u posted it. I want to add something about Shiraz my city. This is one of the most ancient cities in Iran. Persepolis, built by Cyrus the Great (The King Of Iran), is one of the oldest monuments of the world that is here. And I want to say something about our Religion. We are muslims but we are NOT Arab. We ARE NOT terrorist! Most of the people think that V R Harsh people! Women and girls are the most important sectors of society and we have a lot of educated ladies that are University professors , actress or Scientists. I don’t want to people we are odd or illiterate. Again thank U very much. I hope People will change their minds about Muslim countries. Hello Fatemeh, thank you for stopping by, reading and writing a nice comment! I think people are learning more and more about Iran. So the misinformation is slowly being corrected. I’m an 18 year-old girl from Tehran, Iran. (You may think “Why this girl is becoming so intimate this much soon?! ” well yeah I know, I kinda realllyyyyy like to know other people and communicate with them ) sooo, if you were intrested, let me know ! Hello Delaram, how did your exam go? Hello, Iran is really beautiful, but its beauty is not displayed, no one knows the beauty of Iran! You can see different kinds of cultures in Iran, as if from all over the world in those people. This country is the most historic country in the world. I hope people in foreighn countries visit iran and find out we love our country. I realy want to everyone in world know we admire our leader. I`m an Iranian girl who read your article. I`m really happy that you know how kind we are. I`m always ready to help tourists who come to my city. I live in Isfahan and if one day you come here I can help you to have a better experiment about Iran. Thanks for your great article.It’s very good to see a person from other country is talking about my country that nicely.As the other brothers and sisters said my country is a great country but because of other country’s goverments who are putting my people in a hard situation we have a little hard time these days.After all we know we will leave this hard days behind as we did a lot in the past. Dear Veronika ,I enjoyed reading your post, it’s not the same as you say (this is a kind of compliment :d :d). I hope that one day all the people of the world will come to believe that the Iranians, and especially the Iranian Muslims, are from peace and friendship and not terrorists. Hello Zahra, you’ll soon see how many travellers come to Iran. I’m happy to witness how the country is opening up more to tourism and how people are eager to travel there and bring back amazing memories of a beautiful land and people. I’m glad you enjoyed traveling to Iran. You’re country is beautiful too. My brother once traveled Prague for a conference and he liked your country and he talked about your adherence to the laws and your people’s height. So I would love to travel to your country once. Hello Amir, thanks for your comment. I think more and more people are now learning about Iran, its unique history and seeing the local hospitality and friendliness. More travellers will be coming, for sure! I have been living in Iran Isfahan for 45 years. you describe Iran very well . thank you so much for the great article about Iran and specially Isfahan. I am Mohammad from Iran. if you came to Iran ever again,I suggest you visit north of Tehran province(if you want to see more modern places). And visit north provinces of Iran (like Mazandaran,Gilan and Golestan) if you want to visit more impressive places. Hello Mohammad, thanks for your suggestions! Thank you Alx :) Greetings from Prague! you can find so beautifull pictures on the net. Iran has so different climats in the north there is a lot of rain, forests and the sea but in the middle of Iran you can find hot deserts like Lut desert and in the south there is another climat. I invite you to visit this special country. Fantastic article and highly accurate. Iranians are indeed very hospitable, friendly, family-oriented. Just the type of culture you’d want to visit as a stranger. You’ll be able to feel right at home very quickly. Iran as a whole is a phenomenal tourist destination, boasting something for every type of tourist, including ancient and historical ruins (such as Takhteh Jamsheed), awe-inspiring examples of innovative architecture (such as the ones found in Isfahan, Shiraz, and many other Iranian cities), a wide variety of climates suitable for all types of outdoor activity, such as skiing in the north, hiking (all over), swimming and all water sports (The Caspian), amazing food tours, cultural sites, outdoor markets, and generally, the kindest, friendliest people with a great sense of humor about their history as well as their present conditions. (Just one correction: The Islamic revolution happened in 1979 not 1978.) Kudos, Veronika, for writing such an informative travel piece! i live in iran , and i travel to 25 different famous countries…..
but i think here is wonderful…. Will you travel to Iran again? You can speak so many languages, Bahar? Wow, that’s really impressive! Hi Cyrus, I don’t know where you travel but travellers are definitely not saying that… People are nowadays coming to Iran and experiencing it and spreading good word..
Greetings to Prague and specially to Veronica the beautiful. Fingers crossed you’ll get to visit Iran soon! im so happy now cuz I thought people from other countries don’t like Iran. Hello Sara! Thank you for stopping by and reading :) No worries, I’m meeting more and more travellers who have been to Iran or plan to go. Your country is becoming popular among travellers! Your English is great btw! Hospitality in Iran is unlimited; it goes “to infinity and beyond”. The Iranians believe that the guest is a gift from God, So the guest will bring blessings to the house.For this reason, the Iranians are very interested in the guests and welcome guests very much and they cherish them like a precious jewel. Thank you, that explains the hospitality very well :) It’s a lovely treat of the Iranians and one I hope people will keep even once Iran becomes more touristy. I am from Iran and I like it very much. Iran is one of the safest countries. Although many of its neighboring countries are fighting, but here the situation is quite calm and safe. Iran also has several thousand years of honors and civilization. Every time I think about the misconceptions of people outside Iran about Iran, I feel very sorry. Hello Mahdi, many travellers I’ve met already know how kind Iranians are and how beautiful the country is. Despite the tyranny of government, widespread government corruption and discrimination and poverty, the Iranian people are one of the most welcoming nations. I’m really curious to know how many Iranian dishes you tried and if you liked any, you liked which one the most? I’m originally from the beautiful north of Iran,Gilan,Rasht ,which is famous for its diversity of yummy dishes!I know how to make stuffed eggplant(bademjoon shekampor) and stuffed chicken,two of the famous Northern dishes which are to die for!Served with rice grown in Rasht and saffron grown in farms of Neishabour ,where I live! Visit Rasht for food that are finger-licking good.Go to Fuman and see Rudkhan castle.Go to green Lahijan and drink its tea served with special cookies,visit its tea and rice farms and take amazing picturrs(in spring )!All situated in beautiful Gilan! Thank you Darya! That sounds great! I’m iranian and i tell you everything in this article is true but if you ask any iranian about their government he/she will tell you i hate my country i hope the relationship between iran and west become better. Hello veronika. im iranian and i live in esfahan. its an interesting article and iran is historical and beautiful country for travel and tourist. i hope you come back to iran and the see beautiful places in iran . I have to say we are proud of our country and our leader . I suggest you to visit iran . It’s safe and advanced and great country . Well, it was cool that your opinion was so close to our senses. In any case, I wish peace and kindness and smile to all the world. Thank you Siavash, happy to hear the article reflected Iran well. I’m Iranian . I’m so glad that see how your are thinking about Iran and Iranian . Our people are really so nice and kind.we really love each other . Iran has different beautiful places to see .come to Iran and see what some news tell about us are not true.iran is safe and we live well. We are Muslims and pray god(allah) we are not terrorism and we love people all over the world. Oh Iran. That lovely Country. I loved it there when I traveled there 4 years ago. I stayed for about 60 days and traveled to many cities in there. Shiraz was awesome. So special! So were Isfahan and Tehran but Shiraz was just something else! OMG the this country’s nature is amazing. In my travel to North of Iran Or as locals usually call it Shomal, I practically wanted to record every bit of the nature. People there have a hospitality hardly similar to any other. I’m really sad about what the social media through the world are making them looking like terrorists or wild people. and sooo rich. Probably one of the firsts in civilization. It’s safe there if one be cautious like being in everywhere. actually Surely far more safer than America and many many other countries. People are so deep and understanding there. I will definitely go there again. Couldn’t get enough! It’s true Mahya, Iran is a good place to first get to know Islam better. I’m a Iranian girl and all of them that you see, are true. Thanks for your idea about my country. Girls Iranian are very biutifull ! Very very. But in your photos, note biutifull. Again come to Iran. Come to my city, bojnord. Hello Atousa, thank you for stopping by! It’s hard to do street photography in Iran, I didn’t want to offend anyone by putting the camera in their face :) I’m not the best photographer either. Hi veronika. I would be so thankful if you consider coming to rasht this time you came to iran. The city is awesome , it has many places to see and this city never sleeps. I mean you can go out like 2 am and still you see lots of people in the street laughing and telling jokes and sometimes (not at winter probabley) eating ice cream. The best place you can go is the Municipality building. It’s famous of shanzelize of iran and it’s seriously good. I am living in tehran but i have been there once or twice. Wish you a happy trip. I live in Neishabour,North-Eastern Iran.A city with a really rich historical background. (You can simply google it apart from the many source books about the history of Old Neishabour including “The Patricians of Nishapur” by professor Richard Bulliet). All tourists are cordially invited to Neishabur,the homeland of Khayam: the world famous astronomer,mathemetician,mystic and poet! The homeland of Attar,prominent poet and herbalist! On top of that ,Neishabiur is famous worldwide for its fantastic turquoise and saffron! You ‘ll be amazed at the number of traditional herbalist’s all aver Neishabur,including my husband!This is a heritage left by Attar to Neishaburies! Everyone visiting the city can contact me for more information and to have a blast here!! By the way,It’s my wish to visit picturesque Prague!I’m saving money for it! Thank you Darya, Neishabur sounds lovely! Thank you for your wonderful post. I am happy that you have enjoyed your stay. If you ever decide to come back here, you should definitely give a visit to Rasht, Guilan. We call ourselves the capital of food. There is no way you could walk a street without bumping into a restaurant. We have our own culture when in comes to food. That’s of course, if you have an intrest about food. People here have a insomnia unlike you’ve ever seen. We stay up all night (sometimes for fun) driving around the city (but mostly the young ones). Goulsar, a popular area in Rasht is crowded with people at all hours of the day. It has many boutiques and restaurants and places that are similar to starbucks. I myself have never traveled to other countries because my father believes that i should get to know my country first. Well i have, and based on my experience, you should definitely go to Lahijan. It’s a beautiful city with an amazing view to the whole city. We call it Bam-e-Lahijan. Guilan is one of the best states for its beautiful environment and waterfalls and lakes ,etc. As for shopping, you should definitely visit Mazandaran. Not only the beach there is absolutely gourges, but also there are tons of malls out there. You could have a taste of both worlds. From your article, I figured that you didn’t get a chance to visit north. Well we would love it for you to visit. Sorry for writing so much and taking your time. Thank you Saba! I see, another vote for Rasht and the North of Iran, well noted! Everyone commenting here is giving me such great tips for the next trip :) I really appreciate it! I am an iranian & i know other languages so as I was reading this article I thought I would leave a little comment. hellow im a iranian and so happy and grateful of the article’s writer “veronika”. you know most of the wastern peaple are thinking that iran is a terrorist and raugh country but with this article reader’s will see what the iran realy is. i wish someday all the world find iran as a good country. 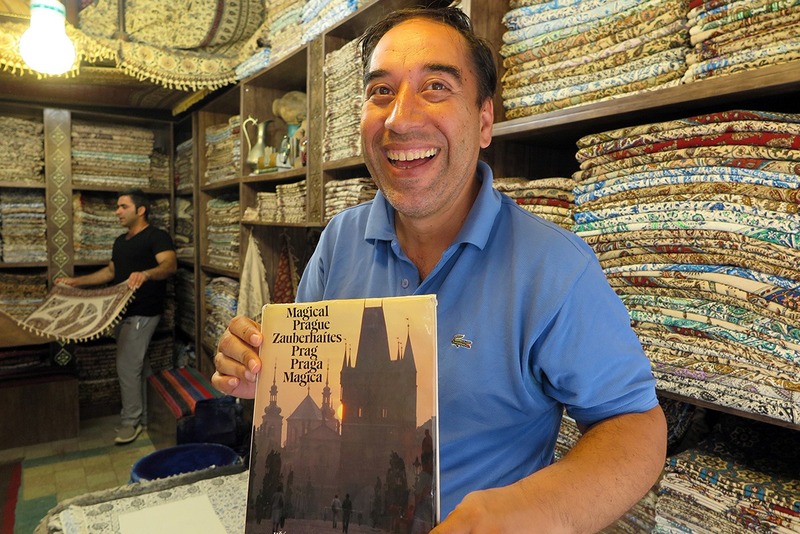 Hello Mohammad, thank you for reading, don’t worry – many people already know what Iran and Iranians are truly like. Visit the north.you will love that. Thanks Soheil, yes, I definitely will one day. So many people suggested it! people in the global.so I suggest you to come to iran and see everything by your beautiful eyes then judge…thank you my dear, veronika.I will be happy to know you more and more. Many greetings to Shiraz, I loved it there! I am curious, what do everyday Iranians think of America and Americans? hey Veronika!! it was a awsome explation that you wrote about iran.. im 15 and im iranian but i haven’t thought about our country like that … anyway when you don’t live in somewhere you can’t see the issues of there too ! im proud to be irainian but i love to travel somewhere in europe or america and live there… and thats why i’ve been trining english since i was 8. i mean … anybody has to have his/her own dreams and thats mine!! Hello Hossein, good job on the English level, I think you have a good chance to travel and perhaps even live somewhere else, if you’ll wish so. Good luck with your studies and all the best for you. Thanks a bunch for your kind comments about Iran and amazing page. You’re really a great help for those who are traveling to Iran by giving a real image of people and their culture. I’m a licensed Tour/Driver Guide for must-see Alamut Region in Qazvin Province and I’ll be honored to introduce our region and The Valley of The Assassins for travelers who choose Iran and Alamut as one of their destinations. I’m really proud that you enjoyed visiting my country. Thank you for reading, Star. Greetings to you and Iran! Thank you for sharing your ideas and experiences. I am happy to hear you enjoyed visiting Iran. I hope to see you again. Thank you Mohamad, greetings to Iran!